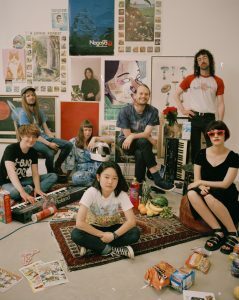 When London-based Superorganism released their first single, some of them had never met. In fact, their lead vocalist, a Japanese girl living in the USA, had blended with a fading New Zealand indie act living in the UK, and another member from South Korea, but living in Australia. A geographically confused entity, then, they met through message boards and wrote entirely online. Debut single ‘Something for your M.I.N.D’ changed everything. Its wacky eclectic pop sound threw Superorganism into the mainstream limelight almost overnight. Soon enough, rather than sharing memes and musical thoughts online, they were appearing surrounded by inflatable whales, using apples as instruments and singing about prawns on NPR’s memorable YouTube music channel ‘Tiny Desk Concerts’. Bravely, the eight-piece moved in together, in London, and things suddenly became a little less virtual. “We never imagined this would end up with us touring and playing festivals,” backing vocalist Ruby tell us ahead of a show at Europavox Festival in Clermont-Ferrand, France. Frontwoman Orono Noguchi cuts across her immediately, joking “I did. Everything that’s happened, I saw coming.” She’s being tongue in cheek, but Noguchi relocated from Maine to London off the back of early successes to make Superorganism a reality. The band, in general, have shown no little faith in the concept. Superorganism’s music is knowingly weird. Their eponymous debut album, released in March, is like a trippy, fast-paced sugar-coated glance at the weirder corners of internet culture, all abstract escapism, and wacky asides. The early single won the band a contract with renowned label Domino Records, and the album’s weirder moments include unwater ode ‘The Prawn Song’ and ‘Everybody Wants To Be Famous’, which walks a fine line between parody and a straight-faced reflection of the band’s origins. Superorganism’s debut album charted at number 25 in the UK, which just goes to show, sometimes the internet really is the best use of your time.